This past March, we received an invitation to attend a Beam Global event in Philadelphia called Spirits Confidential. At this event, we were given the opportunity to sample products from Beam Global’s entire portfolio, e.g. Maker’s Mark, Laphroiag, Cruzan Rum, Sauza Tequila, Knob Creek, etc..
About a week or so prior to the event, I read a brief review of the Knob Creek Rye on BourbonBlog. Knob Creek and I go back a long way, so when I read about this new Rye whiskey, I knew that I just had to try it. Thankfully, their Rye whiskey was available for tasting at the Spirits Confidential event, so we were lucky enough to get a quick preview at that time. I definitely enjoyed what I tasted, but given the circumstances, i.e. a wide variety of spirits and not a lot of time to truly taste everything, I didn’t have the chance to really evaluate it. A day or two after the event, I sent an email to Beam Global and asked for some samples so that we could review it. After about a month of waiting, a full bottle finally arrived. Bottled at 100 proof and hitting shelves nationally in July, Knob Creek Rye is a versatile, full-flavored straight rye whiskey that is extraordinarily smooth and nuanced, offering a distinct rye spiciness complemented by surprising layers of vanilla and oak. It is carefully handcrafted and patiently aged, creating a rich, mature flavored whiskey with a luxurious finish – characteristics that whiskey fans have come to expect from Knob Creek. Appearance: Nice amber color with a lot of legs. Aroma: Woody with a rich caramel, vanilla aroma, and a big hit of alcohol. Taste: Sweet with a spicy, peppery middle, followed by a slight burn, and a lingering warming effect. Appearance: Crystal clear amber color. Aroma: Strong alcohol vapors at first, which is to be expected at this ABV. Once I let it dissipate a bit, I get black cherries, cinnamon, and vanilla. As I keep swirling and smelling this whiskey, I am instantly reminded of a Baba Au Rhum, one of my favorite boozy desserts. I also pick up some mint and other herbal notes. Taste: Medium mouthfeel, i.e. not watery and not particularly oily. Starts off moderately sweet with all of the flavors concentrated on the middle and sides of my tongue. At mid palate, the cinnamon spices starts to build with just a hint of brown sugar sweetness in the background (cinnamon graham crackers perhaps?). This sweet/spicy combinations keeps building, warming and coating your mouth with flavor to the very end. Long finish with a spicy cinnamon and herbal aftertaste. The finish is also somewhat astringent. The Knob Creek Rye is a seriously delicious and flavorful whiskey. I am particularly impressed at how well it balances the sweet and spicy elements that I have come to expect from a well crafted whiskey, and given that it’s bottled at 50% ABV, this is very smooth and easy drinking (I didn’t add any water during this tasting). I really enjoyed the Knob Creek Rye and would definitely buy another bottle when this one is finished. And FYI, I just saw this on the shelves in Pennsylvania where it sells for around $40. At that price point, I think this is a very good value. 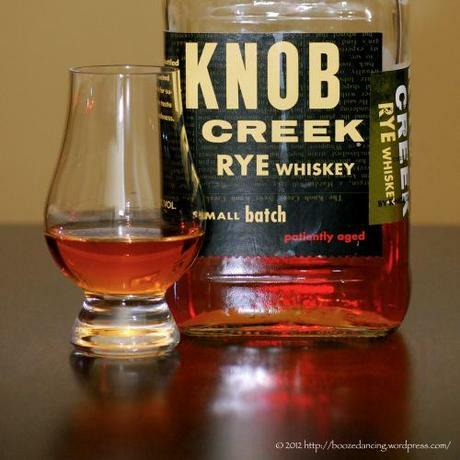 Have you had the Knob Creek Rye whiskey? If so, please tell us your thoughts in the comments below. Thank you to Beam Global for sending us this very generous sample.